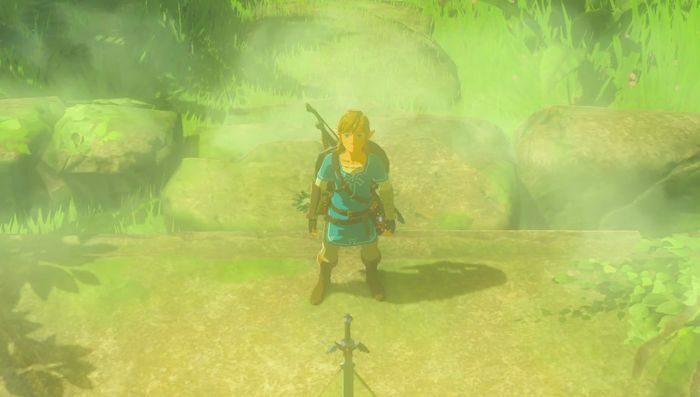 This section covers the Main Quest The Hero’s Sword in The Legend of Zelda: Breath of the Wild. It highlights the requirements on how to successfully draw out the Master Sword as a wielder worthy of its power. This quest is accessible only after finding the Master Sword. Although significant NPCs might provide some clues, it is possible to traverse Hyrule for a period. Head to the Lost Woods which is beneath the Hyrule Great Forest, to get there go to the Hyrulian Castle and advance North. As you reach the Woodland Tower, get past the body of water by ascending Lost Woods to be warped. Advance through the northeast path of the tower, then keep going until you reach a dilapidated archway to find the Lost Woods entrance. Simlar to Kokiri Forest of the older games, choosing a wrong path transports you back to the entrance. Note of the flaming torch, then proceed North, North, then move West, West, then South and take West by the two torches. to the portion of the map that resembles a valley. As you come closer to this area, make sure that you are facing the Northwest then follow the path to arrive to the valley’s entrance. From there, keep going to find the Korok Forest entrance. At the middle of the tree forest is the Master Sword, interact with it and a cutscene will play. However, you have to progress far enough in the game to be able to pull the sword out. As a matter of fact, it requires a total of 13 Heart Containers to draw the sword out and surviving. One Heart Container is rewarded for every 4 Spirit Orbs, by doing the math this sums up to a grand total of 40 Spirit Orbs assuming that you are starting from the default 3 Heart Containers status. Even though this Weapon fits only he who has surpassed the different Challenges scattered across Hyrule, the Master Sword is still subject to ocassional wear and tear. I heard you need 12 hearts to get it I am ready to fight Gannon with 6 hearts but don’t have the master sword.